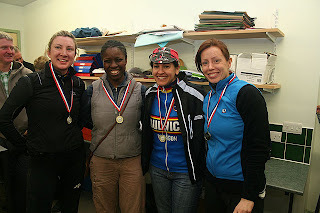 2Wheel Chick: Dulwich Women's Cyclo Cross Team - Success ! Last year we tried to get 4 women from the London area to the start line for the Inter-Area cyclo cross championships. We failed, though it wasn't for want of trying. Things just didn't go our way. Last week we tried to get 4 women from Dulwich Paragon (my club) to the start line for the London Cyclo Cross Association Team Championships. This time things went a bit differently. We started off with one rider who'd been riding the London League anyway (myself), so doing the team champs wouldn't have been a matter for debate. That rider was then joined by another woman who had only just started dabbling in cyclo cross, so she was reasonably keen to have a go (Delia). But even with just two of us that wouldn't make a team. 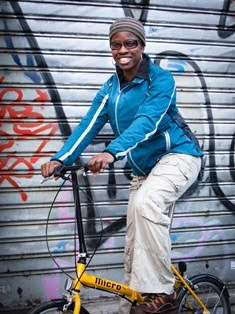 The third woman had a cyclo cross bike that she was only just getting used to. She'd never done a cyclo cross race before, and besides she'd already marked Sunday as the day to do a cyclo sportive she was interested in (Sarah). With a little persuasion and the "your club needs you" pep talk, two then became three. By now we had enough women to form a team - but we didn't want it to just stop there. Having a fourth rider would make life easier on the team, especially if mechanicals occurred. We were then blessed with another rider. She had never ridden off road before - let alone done a cyclo cross race. She didn't have a bicycle, and had spent Saturday running herself silly in a hockey match (Sarah). But she wanted to have a crack at the race. So that was our 4 woman team. We all met up at Wilmington Grammar School, where I presented Sarah with her steed for the afternoon and we did a couple of laps' practice. We were all pretty positive and knew that we were going to try our best, and ride hard in spite of the sticky conditions we were faced with. We all wanted to make it round in one piece and enjoy ourselves too. I think we achieved our goal. On top of that, we received medals for being the winning women's team. We were the only women's team ! Still, I think that our team are winners because we managed to pull off the feat of getting four women from the club to the start line (which many clubs don't manage), and all of us racing well in tough conditions. A good day was had by all. Hopefully this will give other clubs something to aim for next year and we will be able to battle it out like men - or even women, to defend our crown! Congrats on getting a team together and winning. Thanks cyclenewbie, it was a close run thing but we did it!